Psssst.... I have a secret! I do love secrets. Not so much about telling them but keeping them close to my heart. In the past year or so, Kuala Lumpur seems to have been inundated with supper clubs that have become fashionable and the alternative to diners sick of the restaurant scene. Most of them are no longer well kept secrets since mainstream media have covered them extensively. With Transparent Apron, its locale is still under wraps. Run by two passionate chaps, Nicklaus Au and Ryonn Leong, you may need to show them a "friend card" to waggle for a coveted invitation to their cosy get togethers housed in Ryonn's own pad. This follows in the same vein of the London underground supperclubs where you join their Facebook page and get only told their whereabouts via email. Still very much in the works, one session can only fit up to six persons. I was privileged to be invited as a "test bunny" for their food. Joining me in that session were fellow food bloggers and even a restauranteur. Running on an apple theme, our three course (with a bonus item) meal was a well thought dinner that got our lips licking on what else these two talented guys have in store for us. 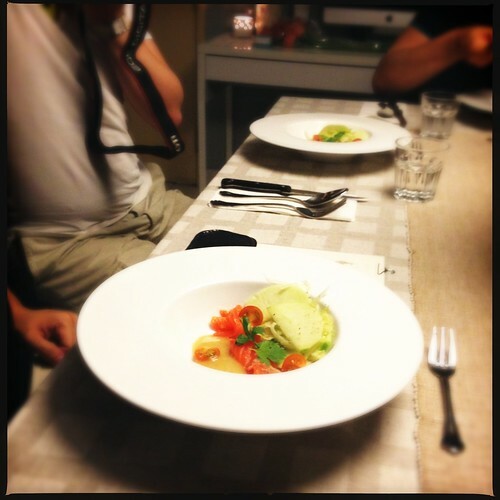 Their first dinner was all about playing in the kitchen with molecular techniques and sous vide cooking. For their second effort, it went back to something simpler but equally tasty. We started out with a burst of colour and flavour, in the form of an apple salad, fish tartare with a ginger lime miso reduction. 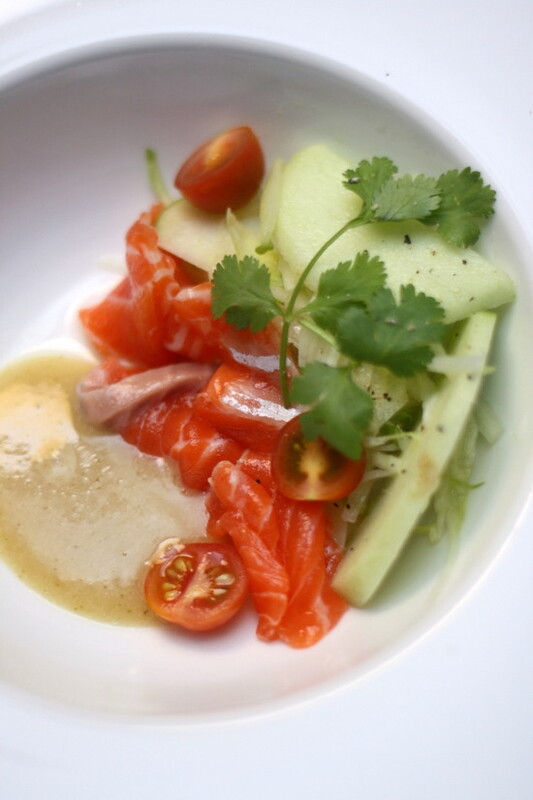 While the fish tartare was in actual fact, salmon sashimi slices, the salad was refreshing and the sauce was a winner with its creamy texture punctuated with bursts of ginger. Lovely starter for a meal. 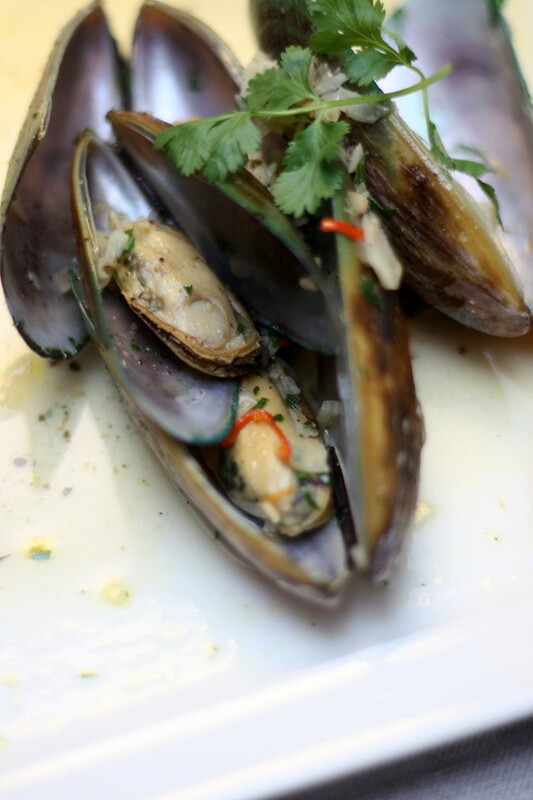 Next came a bonus item, originally thought of as a clams dish, the boys had to tweak with it to work with green lipped mussels. It was good. Again a nice light dish with the seafood being paired with garlic and chillies with a sauce that you lapped up with nice crusty bread. 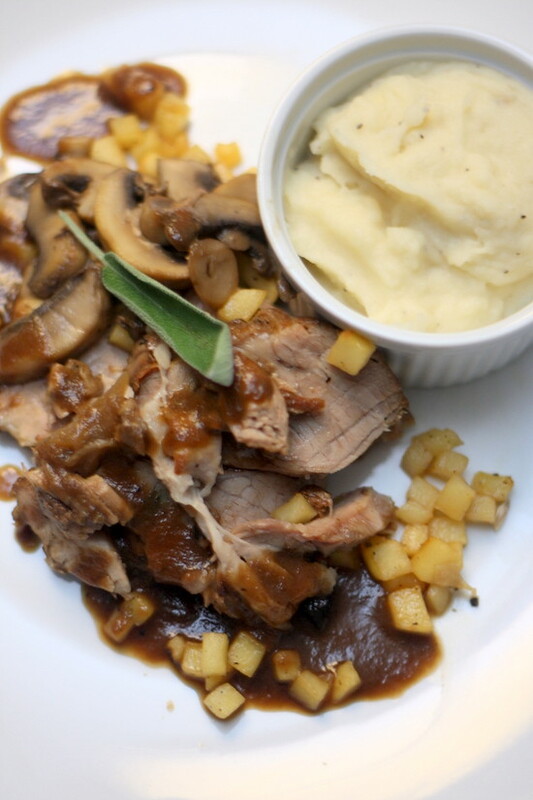 Who can say no to their main meal since it is fork tender braised dark ale cinnamon pork with a mushroom apple sauce. A ramekin of creamy potato mash is set on the side. Purely comfort food, my only complaint was more of that yummy sauce so I can drizzle that on my pristine clean fluffy mash. Dessert is an interesting apple terrine, thin layers of green apples sandwiched with buttery sauces and cinnamon that is paired with a lemon sauce and crunchy nuts. 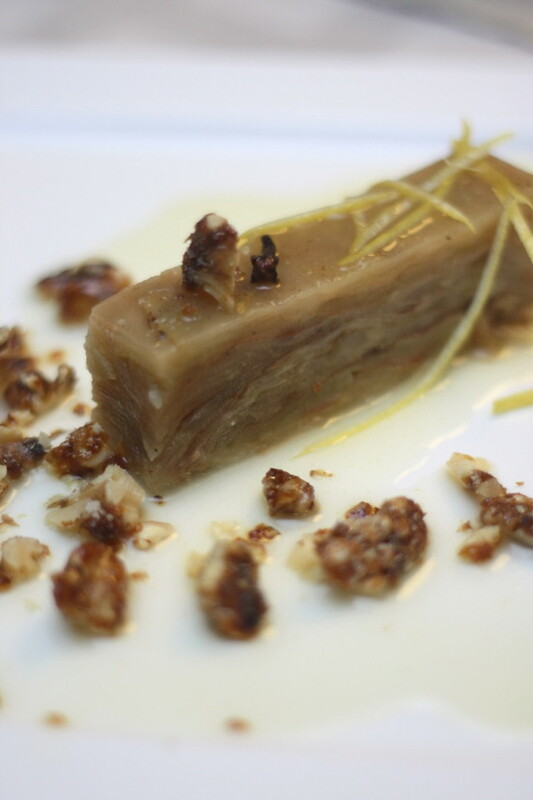 The idea of the apple terrine is fabulous and it keeps to the theme of light and fresh. However, maybe a choice of decadence can also be offered since we always want to end with a sweet note to make it simply memorable. This kind of underground dining scene may take some time for diners to get used to. While even Transparent Apron is not A-perfect and needs some tweaks, I salute them for following their dreams and am happy to be part of this journey to further their passion. For me, this whole set up is all about two aspiring chefs who want to set up their own thing to test the market first before they may jump full swing into the culinary world. It means less structure than a restaurant, so anything goes such as personal touches like their adorable llama mascot with his transparent apron on their menu. Who knows your waiter may break out in song...I heard they do a mean L-O-V-E jazzy number (not only can they cook but they even sing!). Just expect to have a good time here like how your friend invites you over for a meal. 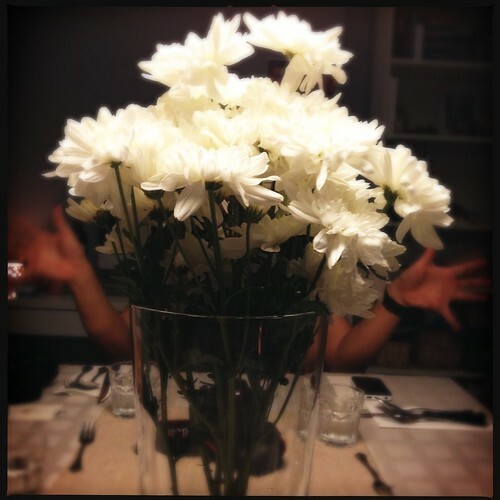 Don't expect full service dining service or a chef with a string of kitchen experiences, and you are good to be an underground supper club convert. More pictures are found in my Flickr set. 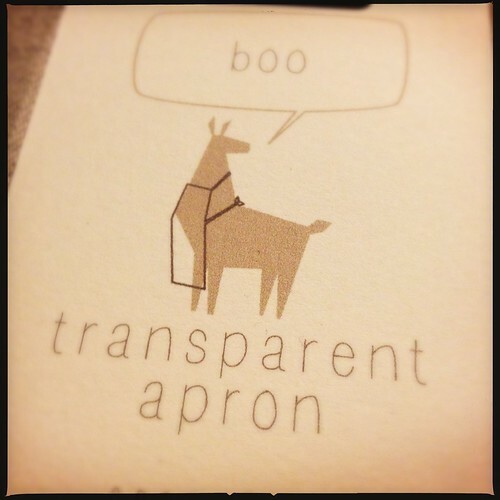 Note: This was a trial run by Transparent Apron. One of my greatest fears when it comes to cooking is no gas. Believe me, it has happened to me before. Just before an important dinner, that’s when the gas tank miraculously decides to die out on me. Darn embarrassing to throw a party for your friends with the intention to be the hostess with the mostest to be left cold with all that food. Big “facepalm” situation indeed. Luckily I didn’t get egg splashed onto my face as I dialed 1-300-888-GAS for a tank of gas Petronas. 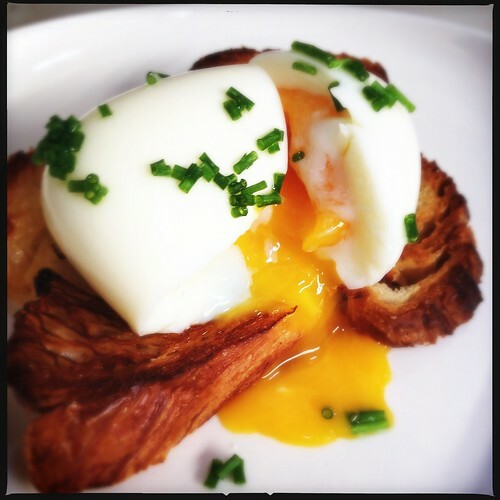 If not, I would not have been able to cook this divine 6 minute egg with its melting yolk centre oozing out. For all your cooking gas needs, call 1-300-388-427 (GAS) for Gas Petronas.You earn Mesra points, there’s safety checks to conduct safety checks upon delivery and the personnel are all trained to handle the situation. For more information, log in to www.mymesra.com.my/beyondgasdelivery. P/s do check out the cool Youtube video (click on this link) on the website. Now how I wish they all did such acrobatics when they deliver the gas. Bring egg to room temperature. In a pot, bring water to boil. Gently place egg inside the pot. Set the timer for 6 minutes. In the meanwhile, get ready a bowl of ice cold water with ice cubes. Once it is 6 minutes, remove egg immediately and plunge into cold water. Leave for 1 minute. Remove. Gently crack and peel the egg. Place on your favourite toast bread and cut through. The egg yolk will be oozing out. NOTE: This is a sponsored advertorial. Elegant Inn tends to be one of those steadfast places we always go for Chinese food. This time, a tasting session of a few dishes they had introduced led to a very nice discovery.... a new breed of crabs aka Dungeness. I've eaten it before in San Francisco but this particular crab comes from Europe. 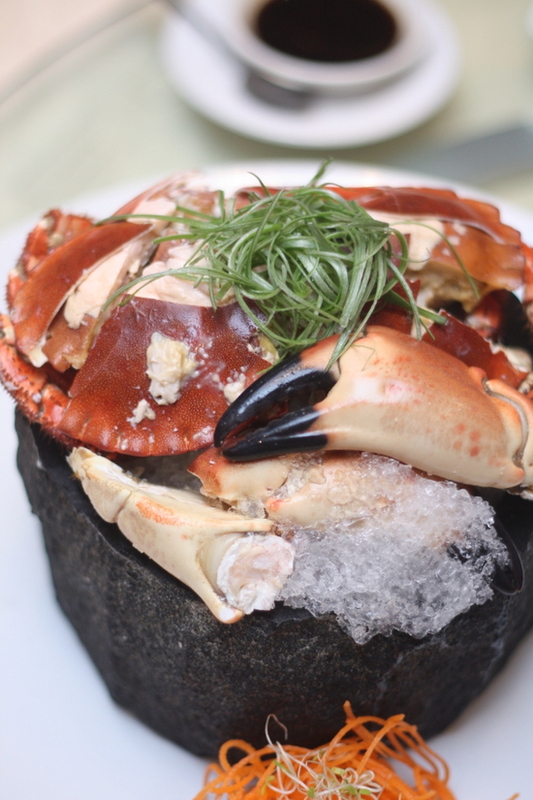 Any genuine crab lover will love this newbie in the Malaysian market, as when eaten cold, the meat is sweet and chunky. Best bits is the creamy roe. Just add a dash of black vinegar and believe me you will be in crustacean heaven. This yummy delicacy is priced from RM168 to RM238 per piece. 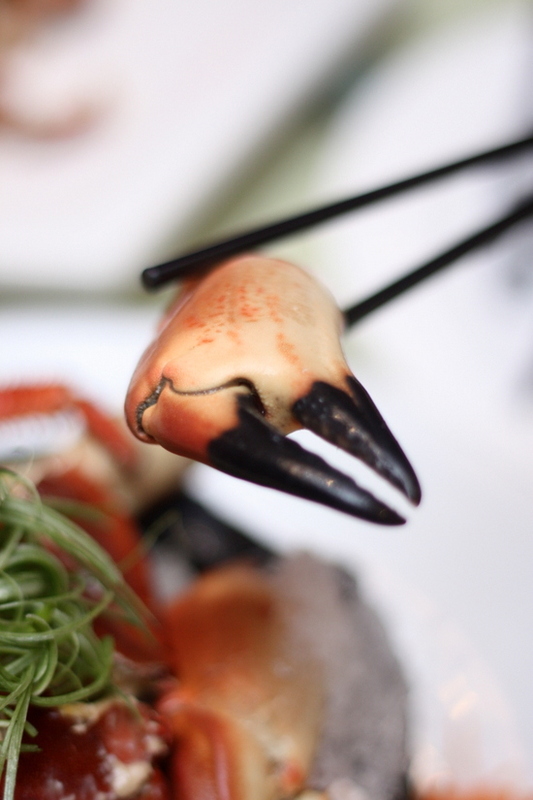 Price tends to vary depending on the size of each crab received from the suppliers so double check prices and also availability of it before you head here. We also sampled the baked version which was good but as exceptional like the supremely cold variety. 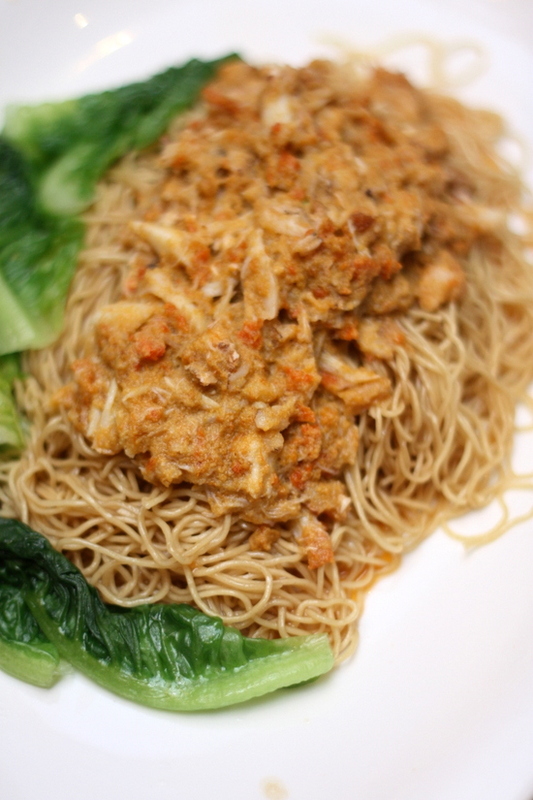 Continuing on the crabby trend, we also had these superb crab roe noodles. It's based on a noodle dish I once sampled in Macau, on the recommendation of J, the owner of Elegant Inn. This small place located next to the port that served these wonderful noodles had the distinction of being listed in Michelin's Macau guide. I've not blogged about my trip to Macau but these noodles were very memorable. Even though you have not tasted the original, this one is almost as good with its creamy golden roe topping thin egg noodle strands that are have a lovely al dente texture. For those who feel the crab roe noodles are too decadent, how about these crispy Chinese noodles braised with fish maw and sea cucumber. Part of a six course meal of RM118++ per person, I love these noodles for its textural contrast - crunchy strands mingle with softened ones that have touched the fragrant broth. 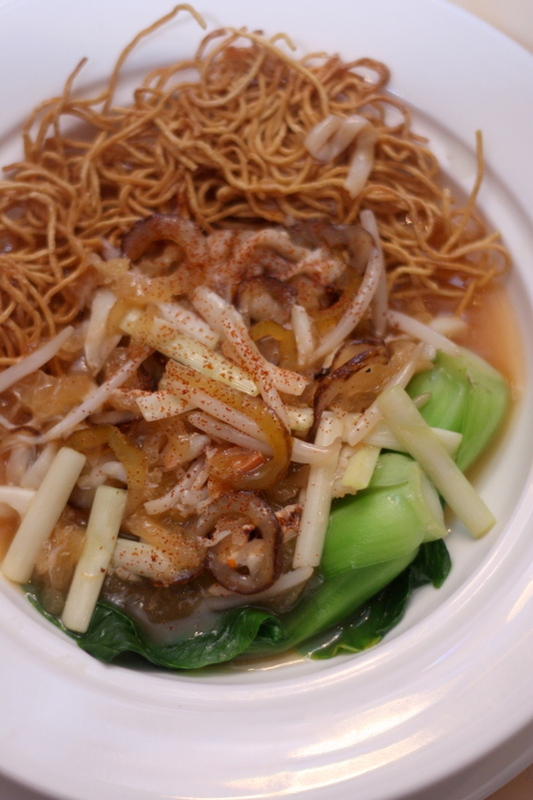 Adding more texture to the whole dish is julienne slices of fish maw, sea cucumber and Chinese chives (the pale version). A dash of aromatic dried prawn roe or har chee completes this wonderful dish. 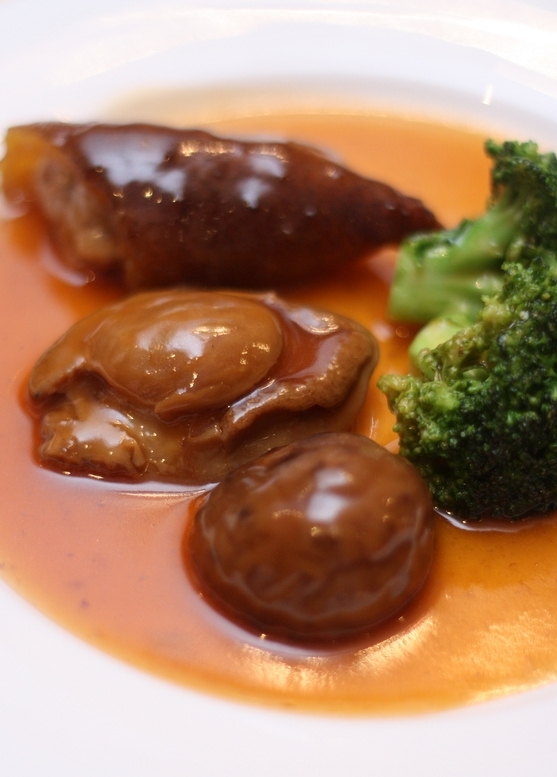 We also sample steamed capon aka yim kai with a fragrant ginger paste but my favourite was the braised abalone served with sea cucumber stuffed with eight treasures, and a braised Chinese mushroom. The abalone comes from the Middle East (my first time eating this type) and has a soft centre. While its fragrance is a wee lacking, this was made up with the aromatic eight treasure stuffing underneath that soft collagen rich sea cucumber. Even the braised mushroom was good. One would have loved to abandon good manners and just licked up all that yummy sauce. 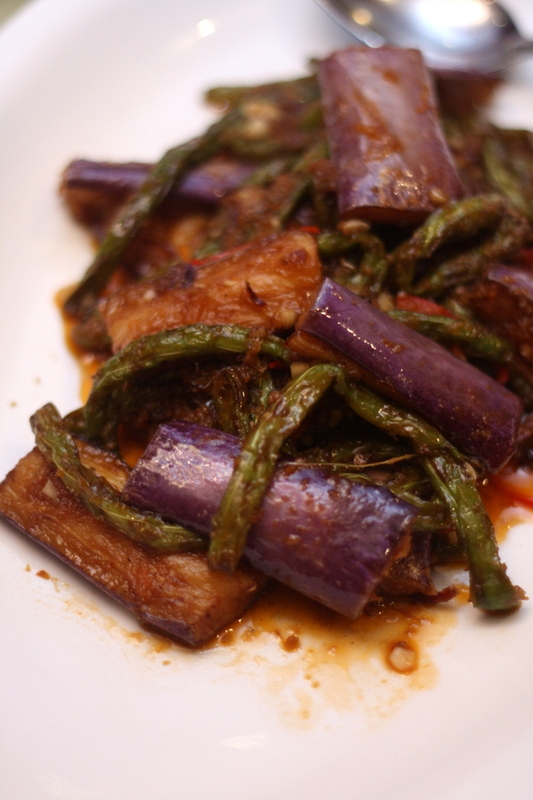 Even vegetables taste divine here and I love this home style cooking of eggplant with longbeans in their aromatic sauce with chilli paste, dried scallops and dried shrimps. Love how the eggplant melts in the mouth with bursts of the dried shrimp flavour coming through. Best eaten with a bowl of hot rice. 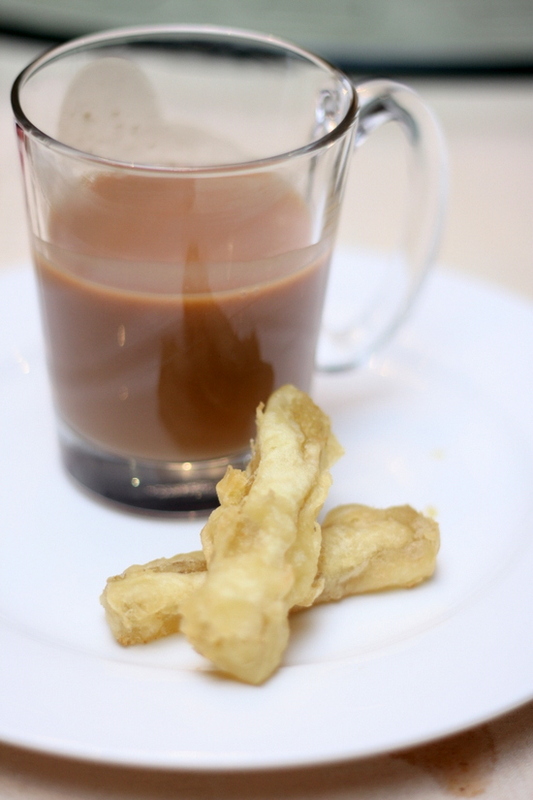 Last but not least, a sample of their new dessert, a nifty thing known as almond milk tea with glutinous rice ball. The tea is milky with hints of almond and once you reach the bottom, there is the surprise of a glutinous rice ball filled with black sesame paste. It is served with a sweet osmanthus water chestnut stick. A twist on the classic dim sum specialty, the water chestnut cake, this one was ingeniously battered and fried hence you get two textures - a crunchy batter on top and the almost jelly like with a crunch from the water chestnut. This is part of the RM118++ set menu. Note, there are various set menus available. There's a 4-6 person set menu for RM338++ with wide choices for dishes. There is a RM118++ per person set and one for RM88++ per person. Details are in the Flickr set. (Non Halal. 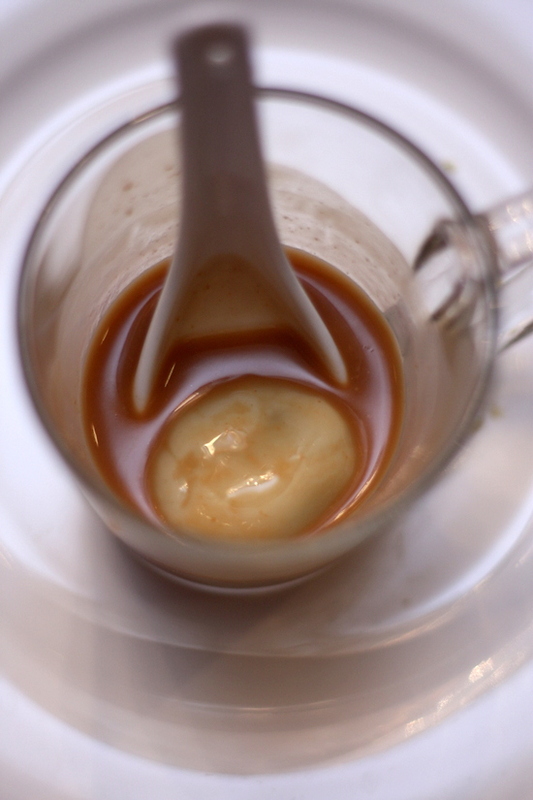 For more pictures and the set menu details, see my Flickr set). *Note: This meal was paid for by the restaurant.